Survival rates for head and neck cancer have improved 55-66 percent from 1992. There has been a link to some head and neck cancer and Human Pappilomavirus (HPV). At University of Iowa Holden Comprehensive Cancer Center, our highly experienced physicians and staff are dedicated to taking care of you, not just your cancer. As part of a nationally recognized cancer center, our team focuses on every aspect of head and neck cancer, including what your life will be like when your treatment is complete. Holden specialists care for more than 350 head and neck cancer patients every year. Our clinicians are top researchers finding new and innovative treatments and therapies as well as what it takes to get you back to your life. We are on the leading edge of head and neck research and quality-of-life issues, always searching for ways to make the best cancer treatments even better. Holden Comprehensive Cancer Center is the only institution in Iowa to hold the prestigious designation of Comprehensive Cancer Center by the National Cancer Institute (NCI). NCI-designated Comprehensive Cancer Centers are rated in the top 4 percent of the approximately 1,500 cancer centers in the United States. To be considered a "comprehensive" center means our teams have expertise in clinical, laboratory, and population-based research. Our doctors and staff are on top of the newest developments in cancer research, treatment, and diagnosis. In other words, "comprehensive" cancer care means our team of experts will design a treatment plan that is tailored to your individual needs. When it comes to treating cancer, we don’t believe in "one size fits all." 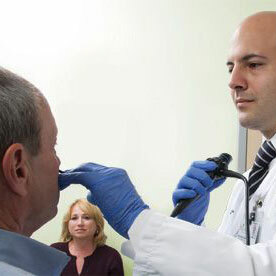 Our multidisciplinary team is ready to offer all of the services you need for your head and neck cancer. A study published in the July 2015 issue of the journal Cancer showed that patients treated at NCI-designated cancer centers have better survival outcomes than patients treated at non-NCI designated cancer centers. We bring experts from different fields of medicine to work together as a team called a multidisciplinary oncology group. The team includes head and neck surgeons, medical oncologists, radiation oncologists, social workers, imaging specialists, pathologists, pharmacists, nurses, laboratory-based scientists, and our survivorship clinical team. Our team meets regularly to discuss the best course of treatment and works together to design the best personalized plan for every patient. Experts focused only on head and neck cancers. Our team of specialists focus not just on head and neck cancers, but on your type of head and neck cancer. They understand the disease and know about the most recent treatment option from innovative surgeries to chemotherapy to radiation therapy. Innovative clinical trials. Not only do we offer access to the most recent treatment methods and therapies, our physicians are also head and neck cancer researchers, placing them at the forefront of the latest breakthroughs in head and neck cancer. New infusion suite just for you. Our infusion suite was designed with patient input to create a comfortable and welcoming environment. Take our virtual tour. One stop for all surgery. Our surgeons are trained in reconstruction. Not only do they remove tumors, they offer reconstructive plastic surgery to help you get back to your normal self. Whenever possible, we try to do both surgeries in one visit. Quality of life expertise. We understand that as a head and neck cancer patient, you may have side effects from treatments that can change the quality of your life from how you eat and drink to how you speak to how you kiss a loved one. We have been studying these challenges and offering solutions for decades. Survivorship clinic. Holden offers a head and neck cancer survivor clinic to help you transition from cancer patient to cancer survivor. Unique surgical options. Holden Comprehensive Cancer Center at the University of Iowa offers unique surgical procedures for head and neck cancer patients like trans-oral robotic surgery (TORS) to remove throat tumors. TORS offers shorter stays in the hospital, faster recovery, and fewer complications compared to standard surgery. A clinical trial is where research meets patient care. A great deal of research is done behind the scenes in laboratories, long before a clinical trial can even begin. Clinical trials are research studies that test the latest treatments and drugs that are not yet available to the public. These new treatments have the potential to improve your quality of life or increase your chances of survival. For example, one of our studies involves an investigational drug to see if it can reduce mouth pain and ulcers that can be a side effect of mouth cancer treatments. Another one of our clinical trials is exploring the use of electrical nerve stimulation in combination with current treatments to reduce pain and improve function for patients who are getting chemotherapy and radiation therapy for head and neck cancer. Illinois resident Richard didn't like the sounds of the treatment that was offered to him by his home physicians. After a second opinion at the University of Iowa, he opted for a less invasive procedure.